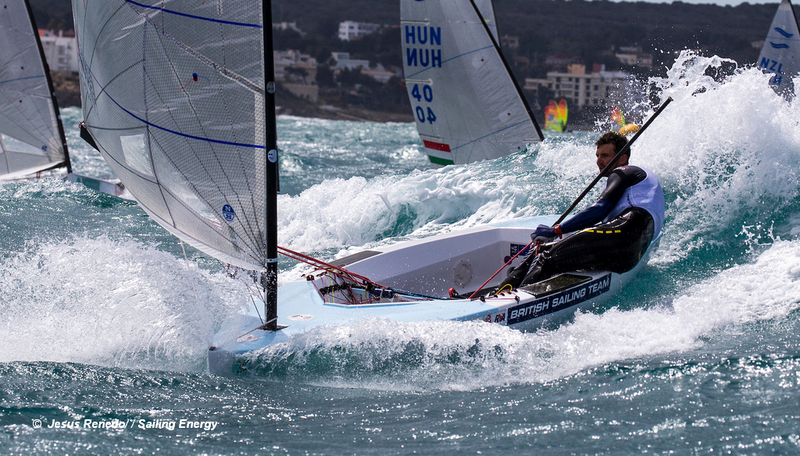 Despite a comfortable medal race win for Giles Scott, it was long-time series leader Andy Maloney who secured gold at the 50 Trofeo Princesa Sofia Iberostar on Saturday. After an epic medal race in 18-20 knots, Maloney did just enough to finish close enough to race winner Scott to take the title by two points. Scott took the silver while Josh Junior crossed in sixth to win the bronze. Big wind was always on the forecast so it was no surprise when the fleet woke to 25 knots and huge waves rolling down the Bay of Palma, and the decision was taken to postpone and wait it out. But, Finn sailors being Finn sailors, they were full of bravado, and raring to go. Finally starting shortly after midday the race was sailed in great conditions, with huge waves. Maloney and Scott tussled up the first beat, but Scott got away and rounded ahead to take the lead downwind and storm away to a comfortable win. Maloney was deep in sixth or seventh and it was looking like anther victory for Scott was looming. On the final upwind, Maloney headed up to the right and after a few good shifts was back in contention and the moved up to third at the final downwind mark. Scott paused at the final mark and considered his options to push Maloney back, but then thought better of it and headed to the finish to settle for silver, while Ed Wright almost caught him at the end. Maloney crossed third to take the gold while Junior finished in sixth to keep the bronze. The Trofeo Princesa Sofia marks the beginning of a long hard season for the Finn class. Most of the fleet will now head direct from Palma to Athens, where in just five weeks time, the European Championship begins, with the next four nation places on the starting line in Tokyo up for grabs. After that, many will go to Tokyo for training, while there are also Continental qualifiers in Tokyo and Rio. Finally at the end of the year, the Finn Gold Cup returns to Melbourne.